inFAMOUS: Second Son remains the best reason to own a PlayStation 4 right now, and that great game is getting a standalone DLC story called inFAMOUS: First Light. The DLC got a new trailer at Gamescom today, which shows off some gameplay and cinematics. First Light stars Abigail “Fetch” Walker, who was an important ally to Second Son‘s Delsin. She has special neon powers that allows her to move very quickly and rapidly shoot foes from a distance. The game seems to be an exploration on her background and her powers. I’m all for more inFAMOUS: Second Son content, but i’m a little skeptical on what this DLC has to offer, from a gameplay perspective. Fetch was a great character that had awesome chemistry with Delsin, but Delsin eventually acquires her powers and masters them pretty well. Is this DLC just going to re-use the same abilities we’ve already used in Second Son? I’m hoping that isn’t the case and fans get some new ways to play in the inFAMOUS world. inFAMOUS: First Light releases on August 27th for the PlayStation 4. Check out the trailer below. 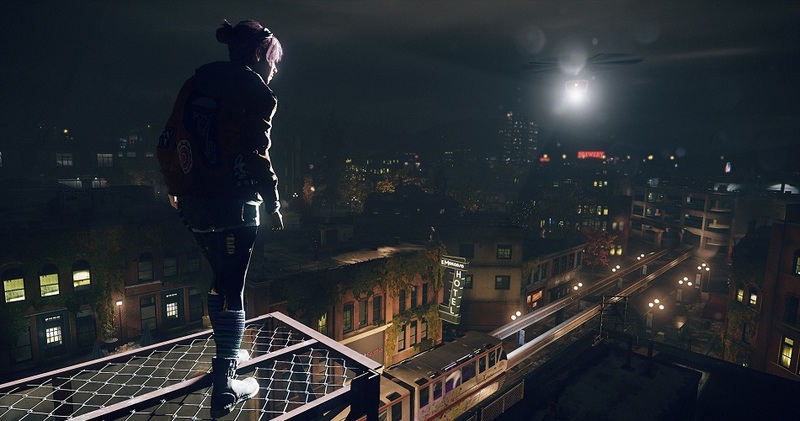 This entry was posted in All, Featured, News, PlayStation 4 and tagged inFAMOUS: First Light, Sucker Punch on August 12, 2014 by Mike Guarino. Dead Island 2 Just Got A Gloriously Gruesome Gameplay Trailer! Dead Island has a reputation for featuring an impressive assortment of ways to brutally kill zombies, and if this new gameplay trailer for Dead Island 2 is anything to go by then that fact is only going to be amplified in the game’s sequel. The game takes place in California immediately after the events of Dead Island and Escape Dead Island as the state is put under quarantine due to this viscous zombie outbreak. It’s up to you to stay alive and mutilate as many zombies as you can in as many ways as you can come up with, so you better bring plenty of weapons. Dead Island 2 is being developed by Yager Development and published by Deep Silver for the PlayStation 4, Xbox One and PC. This entry was posted in All, Featured, News, PC, PlayStation 4, Xbox One and tagged Dead Island 2, Deep Silver, Yager Development on August 11, 2014 by Mike Guarino. Destiny Beta Progress Will NOT Transfer To The Full Game?! The answer to the question of whether or not the progress you made in the recent Destiny beta would transfer over to the full game was up in the air for a long time, but now Bungie has an official answer. Unfortunately, none of the progress you made during the Destiny beta will transfer over to the full game when it releases on September 9th, 2014. Honestly, I can understand why progress can’t be carried over due to all the changes being made, but it’s still disappointing to lose all of the progress made. Still, I had such a blast with both the Alpha and the Beta that i’m more than willing to start from scratch for a third time, only next time there will be a heck of a lot more to do. September 9th can’t come soon enough! This entry was posted in All, Featured, News, PlayStation 3, PlayStation 4, Xbox 360, Xbox One and tagged Bungie, Destiny, Destiny Alpha, Destiny Beta on August 11, 2014 by Mike Guarino. The fantastic Resident Evil GameCube remake that came out in 2002 is getting the remaster treatment. Capcom has announced that they will be remastered the game for PlayStation 3, PlayStation 4, Xbox 360, Xbox One and PC. As for what this remaster will be doing for the 2002 game, the game is being upgraded to 1080p on PlayStation 4, Xbox One and PC, will have enhanced 3D models and textures, and will contain 5.1 surround sound. The game will also allow you to switch between the game’s original 4:3 aspect ratio to 16:9. The Resident Evil remaster is set to be released in early 2015. This entry was posted in All, Featured, News, PC, PlayStation 3, PlayStation 4, Xbox 360, Xbox One and tagged Capcom, REmake, Resident Evil on August 5, 2014 by Mike Guarino. Deepsilver has revealed all of the games that they will be displaying at this years Gamescom convention, with over 150 stations being available for attendees to play them on. Some of the games that they are set to display that are most prominent are Metro Redux, Risen 3: Titan Lords, Sacred 3, Dead Island 2 and Emergency 5. All of these games definitely have different kinds of appeal, although Dead Island 2 is certainly the most popular game they have set to display. Their original Dead Island was a very successful survival horror role-playing game, and the sequel is currently targeting a Spring 2015 release on PlayStation 4, Xbox One and PC. This entry was posted in All, Featured, News, PC, PlayStation 4, Xbox One and tagged Dead Island 2, Deep Silver, Metro Redux on August 4, 2014 by Mike Guarino. Next year, Uncharted 4: A Thief’s End will debut for the PlayStation 4 and usher in one of Sony’s most beloved franchises on a next-gen console. The game is being helmed by Bruce Straley and Neil Druckmann, who were both responsible for The Last Of Us, but don’t expect them to be bringing any themes from that game over to the Uncharted series. I’m very glad to hear that Uncharted will be keeping with the light-hearted tone that has come before. After the amazing response to The Last of Us and the pretty gloomy teaser that Sony showed at E3, it was starting to look like things were heading to dark territories. Uncharted remains my favorite series that Sony has going, so let’s keep what makes it great intact. This entry was posted in All, Featured, News, PlayStation 4 and tagged Eurogamer, Sony, The Last of Us, Uncharted 4: A Thief's End on August 4, 2014 by Mike Guarino. No Man’s Sky is shaping up to be one of the most intriguing games of the year, with all gameplay we have seen being space travel through a world that is infinite. This game was shown at PlayStation’s E3 press conference earlier this year, but it has now been confirmed by the developers that the game will also be coming to the PC at a later date. No Man’s Sky does not currently have a release date. This entry was posted in All, Featured, News, PC, PlayStation 4 and tagged No Man's Sky on August 1, 2014 by Mike Guarino.